So ... swine flu, eh? 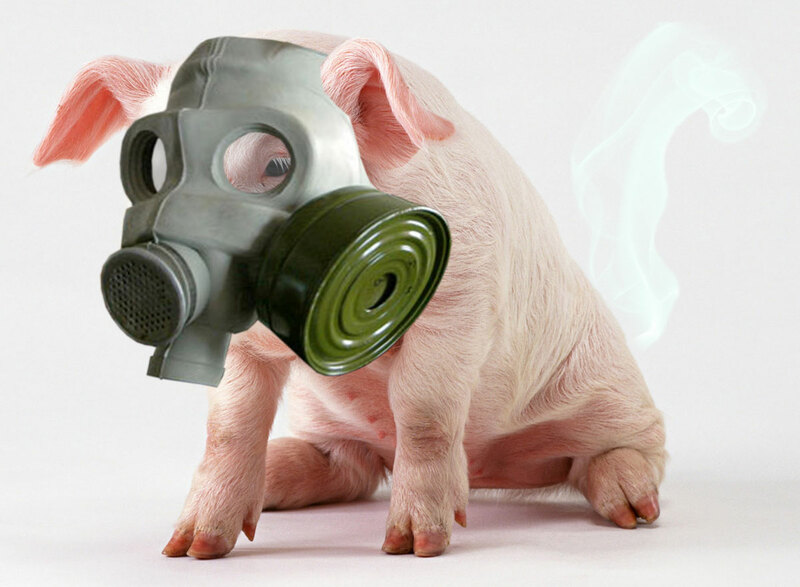 You may remember way back to the uncharted backwaters of time, when I wrote about the swine flu before. It's gotten worse, of course -- people are going batshit butternuts crazy over it now. Not sure why exactly, as most reasonable, reliable metrics show that seasonal flu is far more likely to turn you into a flesh-eating zombie than the swine flu. Sorry, "H1N1 Influenza A." But then again, it is kind of fun and exciting to cook up a bunch of bacon and ham and pork BBQ and Spam-infused foam reduction served three ways* and make up little canapés and hors d'oeuvres and other foreign words and throw a "swine flu party," so maybe people are onto something. Oh ... you mean that isn't what a "swine flu party" is? Wait, what? People are deliberately exposing themselves and their children to an unpredicable, uncontrolled, rapidly-mutating, potentially fatal pathogen in the comfort of their own homes? For real? Hmm. Maybe we sort of all deserve to be turned into the eternally hungering undead scourge. Anyway. Look, get the flu shot and the H1N1 vaccination, or don't, I don't care -- it's a personal choice. There are always risks, and there are always rewards, and it's a cost-benefit analysis that everyone has to make at one time or another. Like, I can't get tetanus shots any more, because I am allergic to something in the vaccine, so I make it a personal goal to get through each day without stabbing myself (intentionally or inadvertently) with rusty nails. Q.E.D., or quid pro quo, or something in Latin. I can't tell you what to do, and I wouldn't want to. Be careful out there, is all that I am saying. As The Refreshments sing: "Everybody knows the world is full of stupid people." Don't be one of them. Standard trivia rules apply: no Google, no cheating, no calling your readers who are pharmacists and/or infectious disease researchers and/or nurses for hints, etc. I'll post my answers on Monday night after 5pm. Good luck! * Guess who watches "Top Chef" and rolls their eyes right out of her head whenever anyone serves "infusions," "reductions," "foams," or anything "three ways"? ** Except when it is. file under Blahblahbittercakes and Bitching, Crazy, Hypochondria, Sickness, WTF? ooo TB, didn't think of that one. And leprosy, I didn't think of that one either!